Not a leaf stirred. Not a bird chirped. Not a cone dropped in the forest in those moments we rested on the steep, rocky trail. But for the steady rhythm of Legacy's heart against my leg, the soft expanding and contracting of her rib cage and the occasional licking as she moistened her mouth on the bit, the stillness would have been absolute. Grateful for the presence and strength of my little bay mare, I waited for her to air up so we might continue climbing. The adventure had started well. 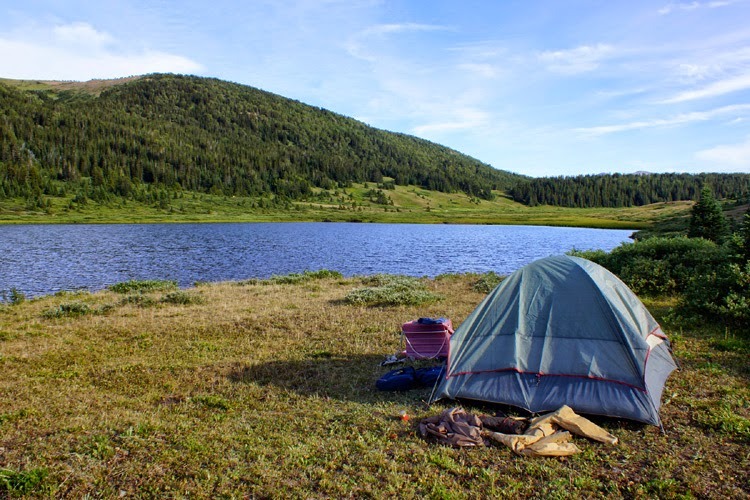 On August 8, 2014, Lynne and I happily tacked up at Tatlayoko Lake for a 3 ½ day pack trip into the Potato Range. Lynne rode her good gelding, Free. I rode Mistral, my 5 year old mare and led Legacy, packed. All three are well-bred, trained reining horses. 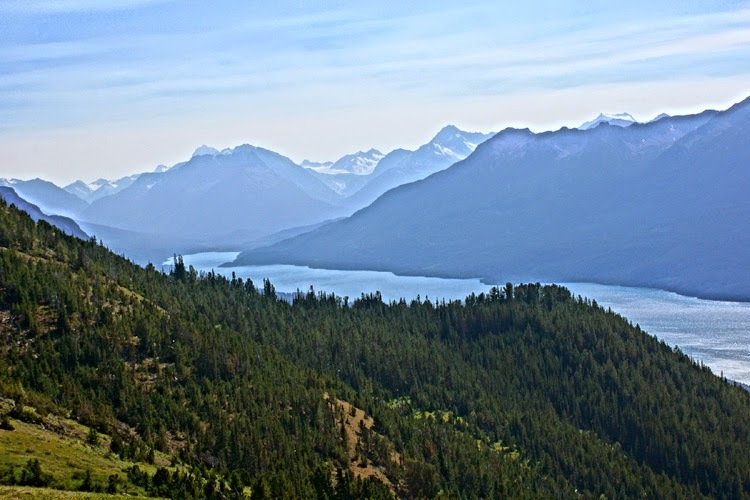 We planned only to ride to the top and overnight in a rancher's cabin. 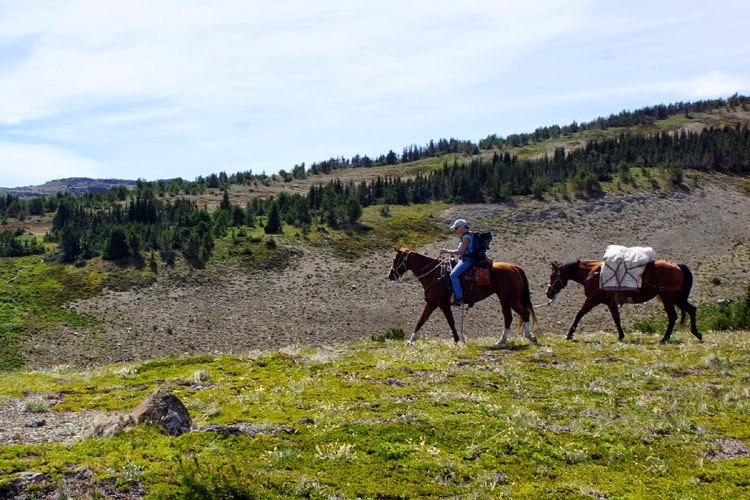 The three-hour plus ride, an elevation gain of over 3000 feet, would test the condition of our horses but the weather was perfect, the horses healthy and Lynne and I eager and excited. By nightfall we had grazed the horses, feasted on Salisbury steak and mashed potatoes and tucked ourselves in our sleeping bags on the wood benches. The comforting soft clang of the bells on my horses assured us all was well with our companions. 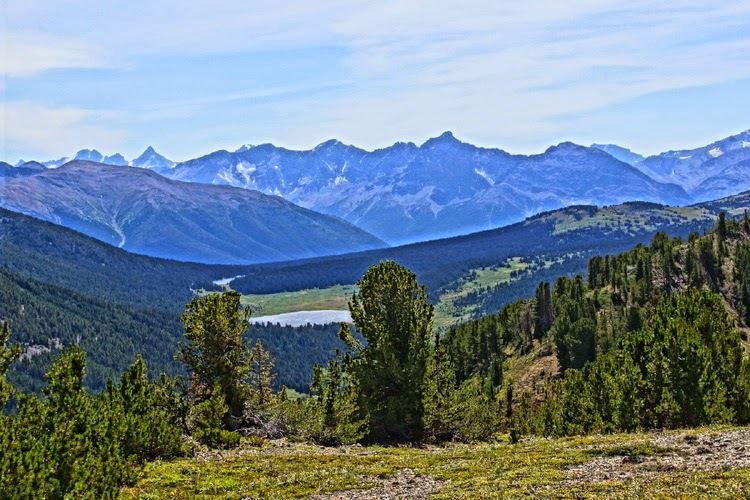 The next day, under warm sunny skies, we rode the historic Potato Trail to the south end of the Potato Range, taking in ever-changing, spectacular scenery and stopping for a late lunch above Fish Lake, our destination for the night. 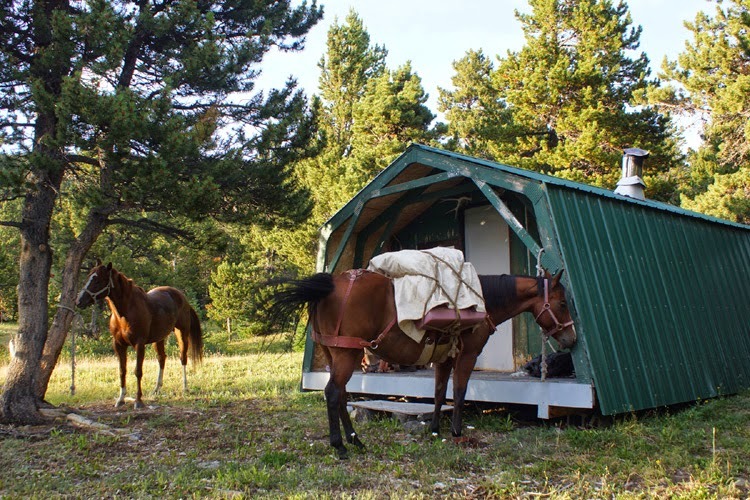 We set up our little tent beside the lake, grazed the horses, and then tied them to trees since there were not any tall enough to high line. 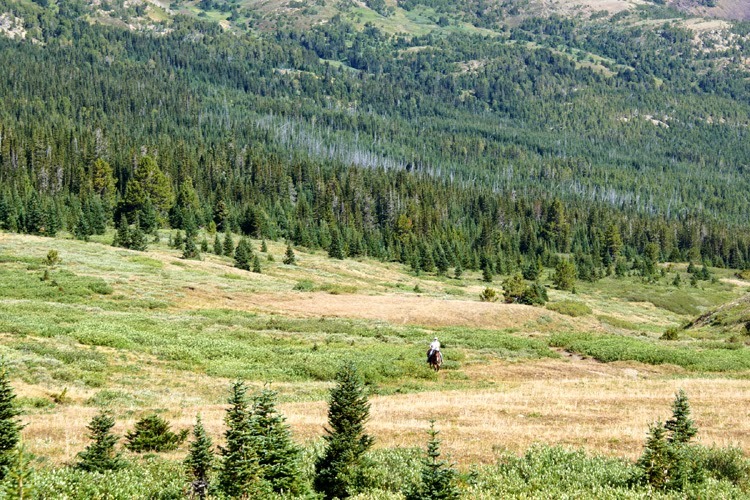 We shared the meadows with a few cattle on their summer range but, thankfully, the grizzly, cougar and wolves that inhabit the area didn't make an appearance. 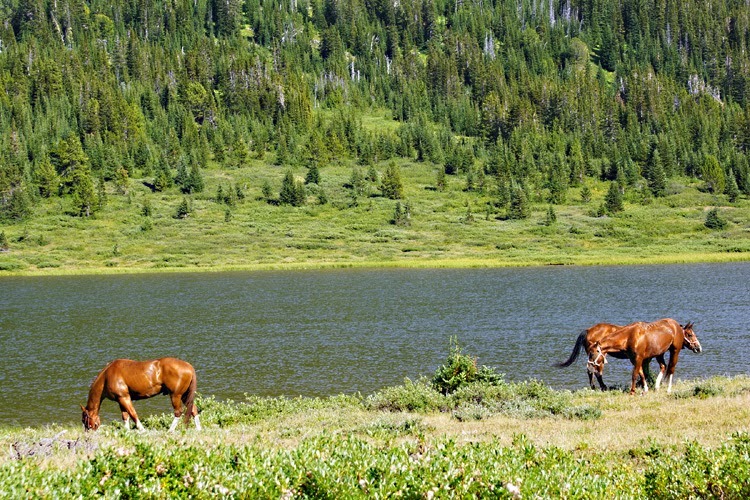 August 9 - Horses grazing as we set up camp at Fish Lake. 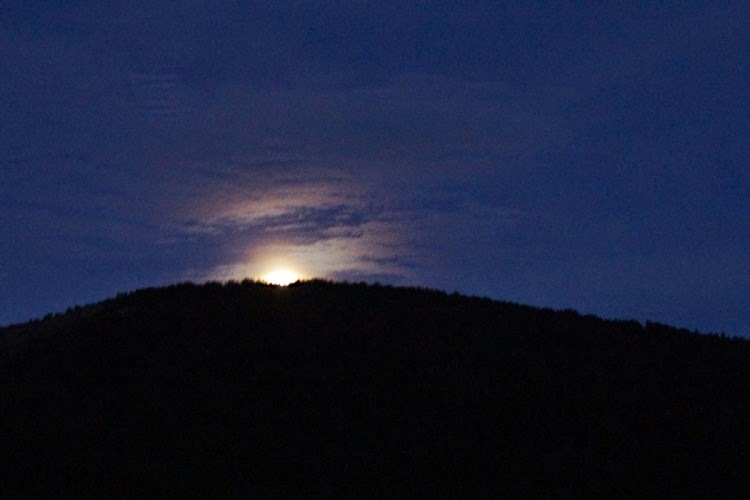 Lynne went to bed early but I stayed up to watch the moon rise, one day shy of full "Super Moon". I was not disappointed although the photos I took don't live up to what I witnessed. Once, during the night, wild clanking of the bells woke us and we leaped out of the tent to see the horses, obviously startled but still tied, staring into the bush. At 6:00 a bellow from a bull woke me again. Apparently we were camped on a trail he wanted to take. I shooshed the cattle back but, awake now, grabbed the camera and took a few photos of steam rising from the lake while I waited for Lynne to get up. After an hour or so, I decided to graze the cold and hungry horses. Since Free would not have been happy if I left him tied, I turned him loose with the shank dragging as Lynne had done the night before (because his hobbles were soring him), hobbled and belled Mistral and lead Legacy away from camp. August 10 - I wonder if that's the cow that started all of this? The horses had grazed a half hour or so when it happened. A lone Charolais cow skirted the trees above the grazing horses, distraught and looking for her calf. I saw her only a few seconds before Free who, for reasons known only to him, trotted briskly to the cow. I just had time to think "That isn't a very good idea," when the cow burst out of the trees. Free turned and bolted. Mistral, in her hobbles, lunged after him. Lynne, now up, could only watch as they raced through the trees above our camp and over the hill. I made my way back with Legacy, now agitated that the others had left, quickly saddled her (and yes, I was plenty upset because I know how bad this scenario can be...) and rode down the back trail. When I didn't see tracks, I returned and searched areas around the lake. Failing to find any trace of the pair, I packed for a longer ride. I suspected Mistral had broken her hobbles but Free's dangling lead shank, sure to get tangled in brush, worried me. August 10 - Lynne took this photo of Legacy and I returning from our first searches. We now know Mistral and Free did run into the trees, then bushwhacked until they got on the trail a few km north. This shows the vastness of the area Mistral and Free were lost in. "I'll have to ride down the back trail," I told Lynne." If I don't find them down the trail a bit, I won't be back tonight." Lynne had an InReach, a satellite communicator, and after a crash course in using it, she gave it to me since I was tracking the horses. I told her there was a cabin a short distance away and how to get there but she said she would stay at camp in case the horses returned. "I hope I see you in a couple of hours," Lynne said. She didn't see me for more than two days. 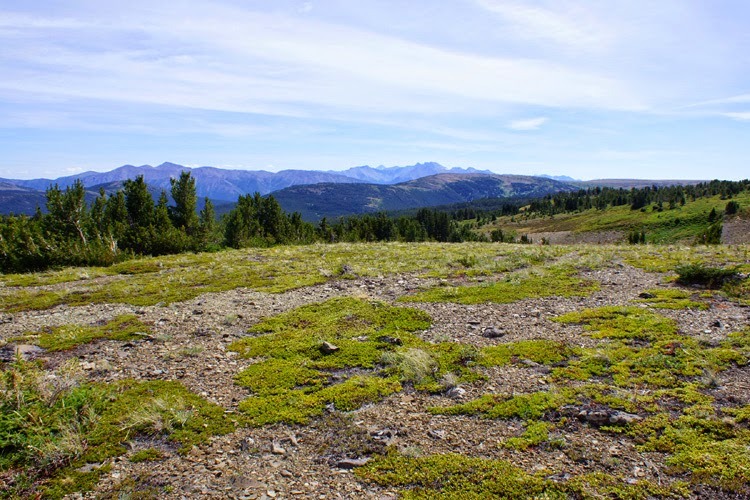 I picked up Free and Mistral's tracks (and the mark of the dragging lead shank) about three kilometers down the trail and all the way to the open meadow west of the cabin where we had spent the first night. I felt hopeful – obviously they were headed back to the trailers. I checked the cabin and when they were not there, started down, about a two-hour ride. My optimism evaporated. I didn't see another track. When I got to the trailers, I immediately looked up a phone and made some calls. That's how I met Len and Joanna Knight, who live at Tatlayoko Lake. Then, and in the following days, they provided a base contact, a phone and a lifeline to local connections. Legacy, not in condition for this much riding, was tired. I stopped several times to let her blow. Those tender, bonding moments alone in the bush encouraged me to "dig deeper" for strength – if Legacy could do this, so could I. As I came out of the trees at the top, I eagerly looked for two sorrels grazing the meadow where I had lost tracks the day before. Nothing. I knew I must rest Legacy for a few hours so I continued on to the cabin and unsaddled. There, I communicated with the Knights and friends from home on InReach to coordinate search efforts. My first priority was rescuing Lynne, who had already spent one night in a tent in grizzly country. I had been told before I left the trailer that Alex Bracewell (Bracewell Alpine Wilderness Adventures), who took guided tours into the Potatoes from the other end, would pick her up (a huge relief) and was waiting for confirmation of that. Again with the help of the satellite communicator, I learned Jordan Grier and Pat Jasper would arrive the next day to assist us in our efforts to find our horses. August 11 - I took this photo from the cabin the night I stayed there. I searched several places in the area in the afternoon and evening, still convinced the missing pair were close since they had not taken the trail down. 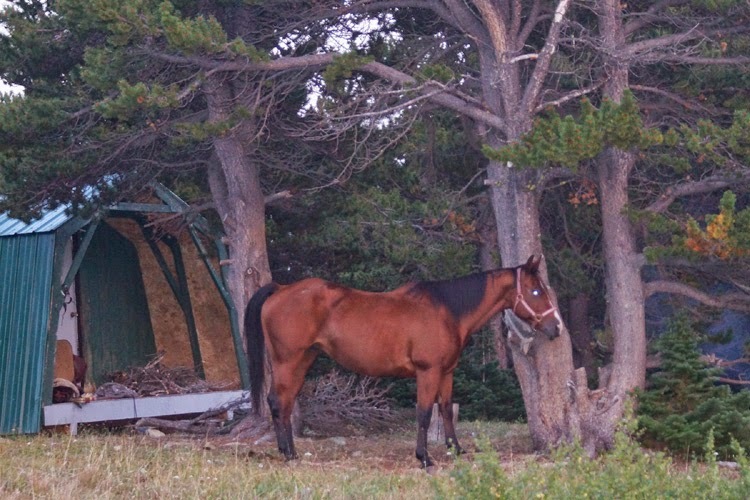 Then I grazed and watered Legacy and tied her to a tree by the cabin. Even though I had not found Mistral and Free I felt somehow close to them on the mountain. I hoped they would come to Legacy in the night. August 11 - Legacy tied by the cabin. ﻿﻿﻿My strength was starting to wane a bit now. I forced myself to eat and drink but I didn't have much food and wasn't sleeping well. 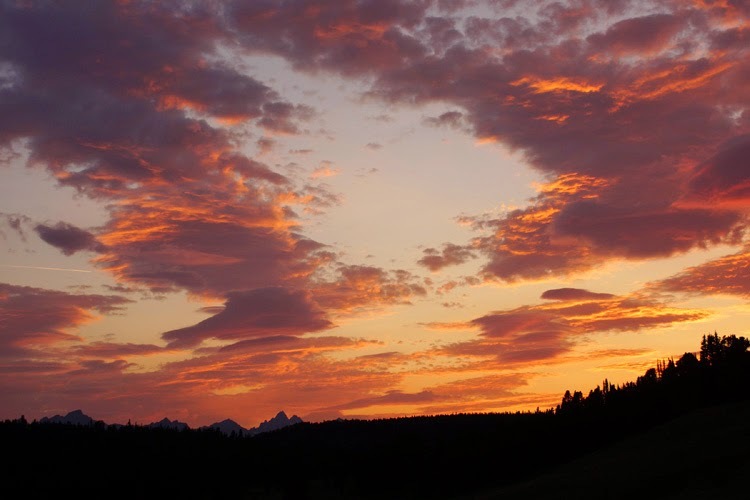 After a fitful few hours on a wood bench in the cabin, I made the worst coffee ever on the wood stove and rode the area again – still no clues and no response from Legacy either, who I counted on to alert me if they were near. Jordan and Pat arrived around noon with extra horses. This is when I found out Lynne had not been picked up – now two days in the wilderness alone! With this information, we quickly ate the lunch they brought and continued down the Potato Trail to Lynne's camp by Fish Lake. August 12 - Jordan and Pat arriving with extra horses. 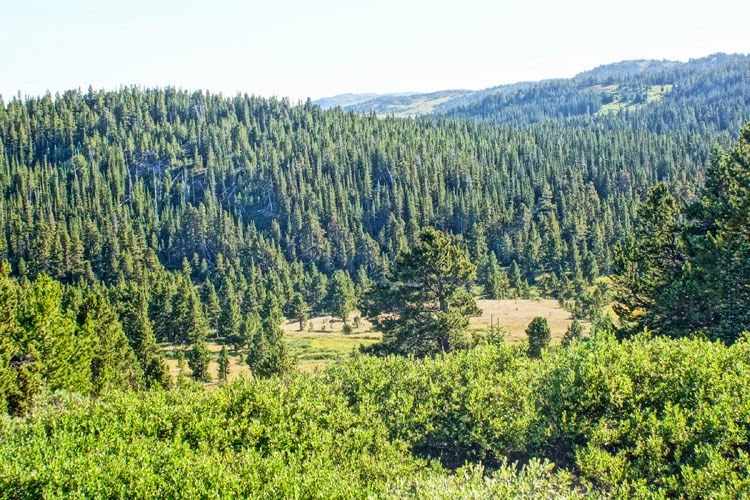 Lynne was not at the camp when we got there but a note confirmed that Alex Bracewell had taken her to the wilderness cabin I had told her about. We packed up the camp on Legacy and I rode one of Jordan's horses to the cabin. My reunion with Lynne was bathed in relief. She assured me she was fine but had been worried about me. "I thought you were laying along the trail somewhere," she said. "You had the hardest job," I told her, "Just waiting with no information." Lynne said the cows comforted her. They were around the tent the first morning but there was not a cow in sight when she woke up the second day. When Alex picked her up, he cleared that up for her. "Did you see the big grizzly?" he asked. "No," Lynne said, "But I guess that explains why the cows disappeared!" Lynne had handled her time alone very well. 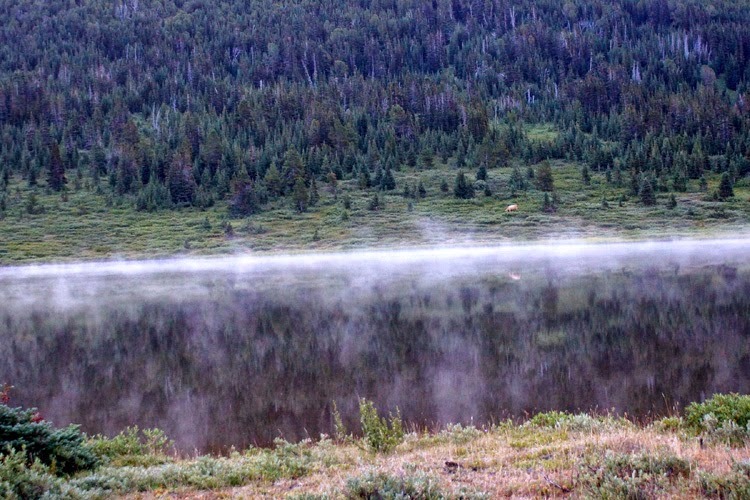 She told me she kept up a camp routine to keep busy; she studied the little cow herd and their habits; she watched the fish jump in the lake and counted tadpoles (Thousands…). I know she would have much rather been searching with me but she knew how to survive. Still, the situation was dangerous and one of many times luck was on our side in those trying days. From Bracewell's cabin we descended to the lake again – at the south end this time, a two hour ride, loaded all five horses in Jordan's trailer and arrived back the north end at 10:00 PM. After unloading Legacy, out rescuers drove home to Hanceville. Lynne, Sharon, Legacy and tack were now back where we started – without Mistral and Free. The next morning we re-grouped. Get the word out – posters, contacts up and down the road, phone calls in case the horses came down somewhere else – and keep searching. We tried to hire a small helicopter to fly the area but most were out fighting wildfires. Mike King was flying over every day and he checked the Potato Range every time. We talked to a Clifford Schuk, a local rancher, about tracking and he agreed to help. One thing we knew for sure – we were not going to quit! Legacy, however, needed to rest. I had a commitment at home so we decided I would take Legacy home and Lynne would stay with Len and Joanna at the lake. 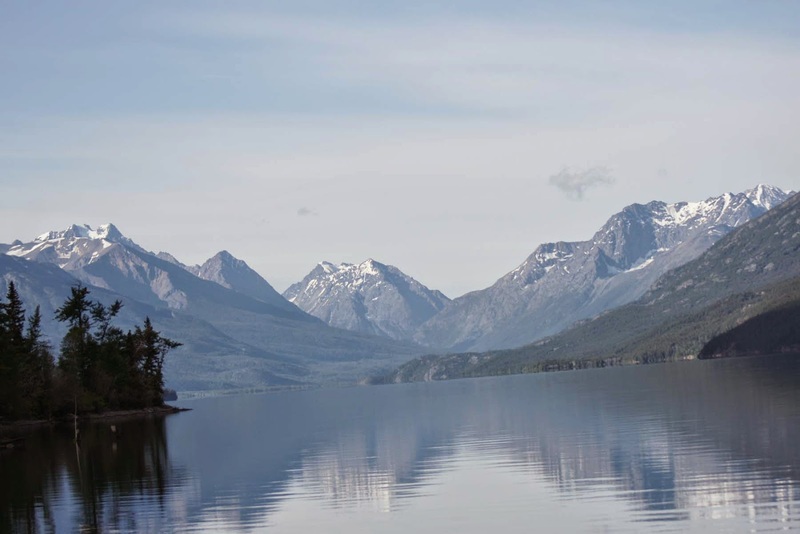 And this is when the full force of the last few days hit me – when I was going to leave the lake without Mistral. Backing the rig out of a tight spot with well-intentioned people yelling directions triggered a melt-down. – everything from "I can't do anything right!" to "I know she's dead!". I cried all the way to Tatla Lake, the only time I cried during the entire ordeal. On the 14th, Lynne and I talked several times on the phone. I organized things at home with the plan to return on the 15th. Clifford took his quad part way up the trail, then walked. He told us Mistral and Free were trying to return to the lake (and our trailers) but were probably stopped by grizzlies foraging on the slope. This was the area I had stayed in for 1 ½ days with no sign of them but I suspect Free's lead shank was tangled until he broke it, which may account for the fact they didn't come to Legacy when we were there. Lynne and I agreed we had to get back up to the area as soon as possible! Lynne was trying to rent/borrow a horse in the area and said she would start up in the morning if I was not there. With that information, I packed up as soon as I could, loaded Legacy, and drove back to Tatlayoko Lake, arriving at 1:00 AM so I would be there when Lynne was ready to leave in the morning. I stopped several times on the ascent to listen and even veered off the trail to search for tracks in the trees on the slope. 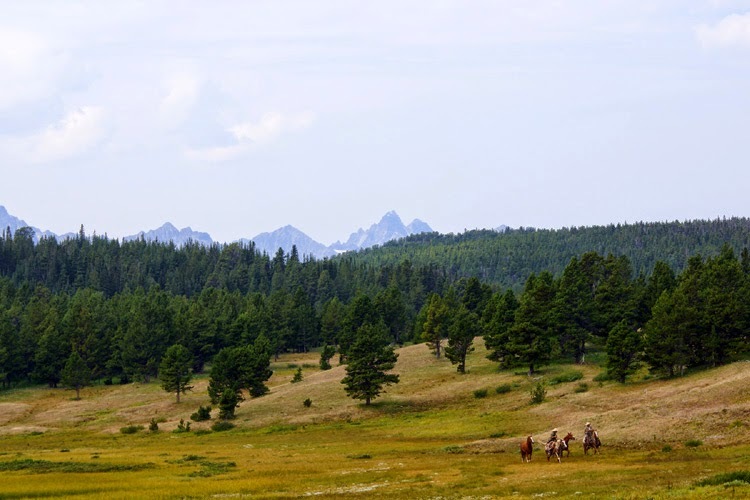 When I reached the open meadow where I had lost their tracks before, Legacy showed no sign of interest in anything besides putting one foot in front of the other, the bell clanging in time with her footfalls. Then, to my right, I sensed movement. I turned my head and what I saw I did not believe – two chromed-up sorrels racing through the brush to Legacy and I! Heads high, manes flying, they tore down the long incline with abandon, with joy and, I think, with much relief. I knew as they ran toward me that they were all right. My chest swelled, my heart pounded and all I could say was, "Oh, my God!" over and over. It is vision that will be forever etched in my memory. I took this photo on the 11th from almost the exact spot Mistral and Free ran from when they came to me on the 15th. Where were they? In the bush with Free's shank hopelessly tangled in trees? Mistral and Free were a little buzzed. They milled around Legacy as if they couldn't stand still. Free no longer dragged his long black shank and Mistral's hobbles were gone. The bell was still around her neck though and they both still wore their halters. Free had some marks on his face from the halter, testimony to his struggle with the dragging lead shank and both had scratch marks from trees on their sides but they were okay other than being super alert. I snapped the shank on Mistral's halter and, with Free following, started down the mountain. About half way down I met Lynne (on Sabina Harris' nice little mare) and Clifford. "They're okay, Lynne," I hollered when I saw them ahead of me on the trail. The inner strength Lynne had called on for the preceding five days weakened as she dismounted and approached Free. On Legacy, with Mistral in hand, I watched her attempting to keep emotion in check. I lived that moment with her, a moment we had prayed for for five days. 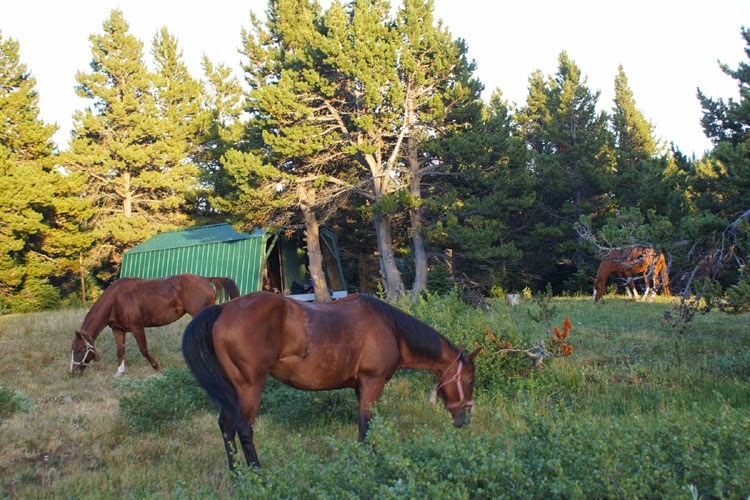 We are acutely aware of how lucky we are to have these special horses back unharmed and are grateful for the many people who helped us achieve that - kind, caring Chilcotin people who put their own lives on hold to help us. I am also grateful to my patient, gutsy mare for carrying me close to 100 km searching for Mistral and Free in unforgiving terrain. Legacy has always been special to me since she is the fifth generation of a strong maternal line of Wildwood horses but the connection is deeper now. If I close my eyes, I am on her back on the Potato Range again. I can feel her muscles under me. I can smell the sweat. I can hear the clacking of her shoes on the rocks. And I can see her head bobbing, ears flicking. It's a memory I cherish. Great story with a happy ending. 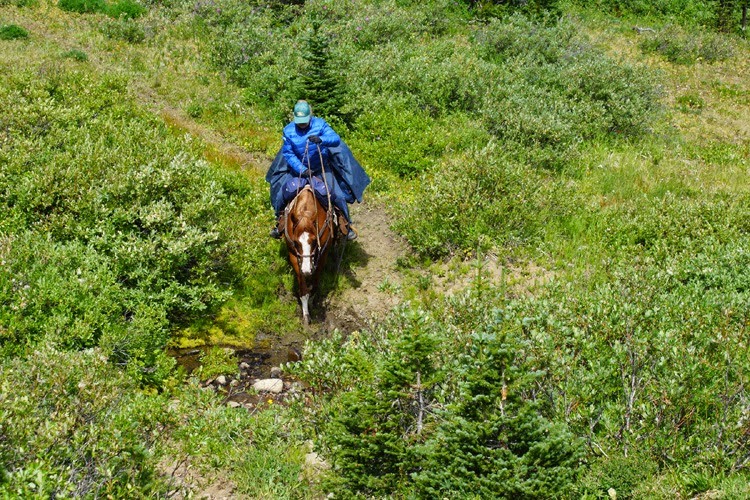 I have ridden the same trails on my horses and had similar experiences. It makes life interesting and stories to keep you into your old age. Thanks for sharing! Yes, the Potato and other ranges in the Cariboo. So much beautiful country to explore and trails to ride. Well done to keep active and adventurous at 70. I hope to be able to do as much when I reach your age!